This season has been full of alterations, and as we move into the Chicago Marathon taper we’ll throw another one at you. This week is the Lake Winnipesaukee Relay, which many of the usual Sunday Long Runners will be heading north to participate, including me. What does this mean for the Sunday Long Run? It means Walt, Ginny, and Carol will be stepping up to take care of the running of the long run, both figuratively and literally. Others that wish to join them should post there desired distance here. They’ve already begun to plan something in the 16-18 mile range. Ok, everyone have a good weekend. Walt, Ginny, Carol: take it from here…. Ok, as I write this, by this time tomorrow we’ll be running along the LynnFells on our way to Breakheart. Those running the shorter loop will be turning back towards Brueggers, those that need to run 18 miles will be following the route map (which I have restored), and a handful of us will be trying to figure out how to stretch this 18 mile run into 22. I thought I had a simple solution, but this route doesn’t go exactly where I thought it did so I’m still working on it. When I do figure it out I’ll post if here: The 22 Mile Route For Week 11. Water Stops: Tomorrow we’ll need a few. First at Citizen’s Bank in Malden. Second at the Knoll by Melrose Middle School. Third at the Saugus Entrance of Breakheart. And a fourth somewhere else. Any help I can get to set these up and get people back to Brueggers would be very much appreciated. The advice for this week: Eat like its race day eve. Saturday’s meals have a great impact on Sunday’s run. The day before your big race don’t get all experimental with your dinner menu. Keep it conservative to known foods you know your belly can handle. Tonight is the perfect time to test out your meal, in all it’s carb and protein filled glory. If it works for you tomorrow, it’ll work on race day. So who’s in and for how much? Also, remember we’re back to our normal 8AM start at Brueggers. Sorry about that, there seems to be something removing the messages from my posts. Quick repost: Hereâ€™s the map. Meet at 7ish if you want to run some/all of the summer route. Meet at 8 if you want to run the lake part. The goal is to all be back at Brueggers by about 10 so we can help out with the ARC race at 10:30. Sorry about that, there seems to be something removing the messages from my posts. Quick repost: Here’s the map. Meet at 7ish if you want to run some/all of the summer route. Meet at 8 if you want to run the lake part. The goal is to all be back at Brueggers by about 10 so we can help out with the ARC race at 10:30. With a glorious 18 in the rear view mirror we come speeding into a 20 Miler this Sunday. – Brand New Faces: Trevor, Krissy, Elizabeth, and a guy Joe knows but I didn’t catch his name, or him for that matter, all were welcome additions running with us for the first time. – A Forrest Gump Moment: no nobody yelled “run Forrest run” which is a runners typical connection to that movie. This week we spotted a white feather hovering along our route, blowing through the pack of runners before traveling on. – Rick’s Cafe: Rick transformed a big rock into a road side stand for us at Breakheart’s Saugus entrance. Thanks Rick. – The Breakheart Hills: Nothing to note here other than we ran them, which is always a notable feat. – Losing Krissy: Krissy almost followed the half marathon route back to Melrose instead of heading towards Farm St. Sprinting up I caught her and shepherded her back to the long route. – Score that an 8: Some runners attempted the school zone speed limit sign record but mustered an 8MPH, well shy of the 13 mark. – Montrose St: Again hills, we did them, we mention them. – Boys will be boys: Lauren got to listen to Barry and I tell duelling stories of stupid boy things we’ve done in our life. It passed the time. – The Big Snickers. While some chommped on gummi bears and others nibbled on mini-Snickers, Barry wolfed down a full size Snickers he had stashed for himself. – Improvisational Route. Sue and Joanneseemed to be everywhere Sunday. Making their own way from water stop to water stop, just when I thought I left them behind I would pull into a stop and they would aready be there. – Quest for the Yellow Jersey: Ginny was well ahead of me leaving the last water stop, but her yellow shirt was a beacon in the distance as I hustled down Main St to try to catch her. Despite running my fastest 16th, 17th, and 18th miles ever I still came up about 10-20 yards short of catching her. – Did I Mention the Weather? : For the first time this season I didn’t have to mention the weather. Cool, dry, perfect for a long run… the weather contributed to everyone’s best run of the season. 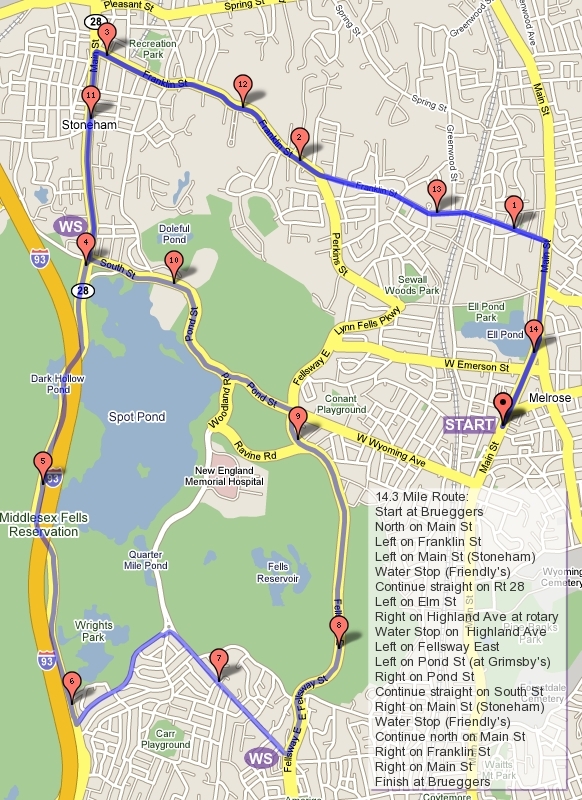 The Route: Out to Winchester, over to the Mystics Lakes, back, and around the backside of Spot Pond. All in small 3-4 mile chunks. No problem. Tip of the Week: If you have a nice outfit you’re planning on wearing on Marathon (or Half Marathon) Day you should wear it this weekend. Test out the feel of it, see if you can find the seam that’ll drive you crazy on race day. Test drive those shorts, that top, the sports bra, the socks. If you make it through this without a blister or a chafe you’re all set. If something rubs you the wrong way, its better to learn it now than to learn it when it counts. Water Stops: I believe I have 3 full time water stop helpers lined up for this Sunday: Rick, Nick, and Erin Lynch. I’ll do the shopping and distribute the supplies at Brueggers, or if one of you wants to pick everything up at Brueggers the other two can meet you at water stop 1 and take what they need. You guys can work out the details. Thanks for all the help! That’s enough typing for one night. Time for ROLL CALL! Who’s in for the Labor Day, Back to School, Looooooong Sunday Long Run?